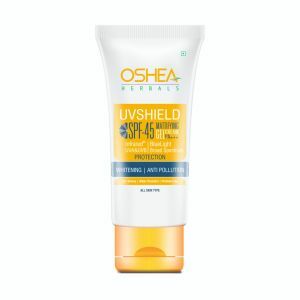 UVShield SPF 45 is a preservative, paraben free, light-weight, non-greasy, water-resistant mattifying gel cream formulation. It protects the skin from UVA, UVB, IR, pollution and Blue Light. It also provides Broad Spectrum Protection, Tan Protection, De-Pigmentation and Skin Whitening. It makes skin softer and smoother, improving elasticity and giving a flawless skin tone.